Probe of microfader positioned over a section of a watercolor by Georgia O'Keefe. Photo: Dennis Keeley. 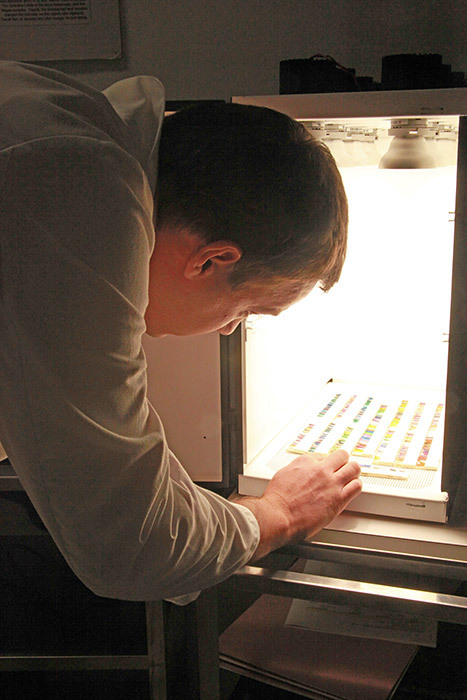 The GCI continues to test the boundaries of experimental light aging to better estimate the role of spectral power distribution on fading rates, to acquire more extensive activation spectra of important pigments and dyes, and to establish highly reliable long-term color monitoring protocols and documentation techniques. Applying predictions based on accelerated aging has always been considered risky because of the possibility that rates of color change may not be the same as for low-level light exposures. 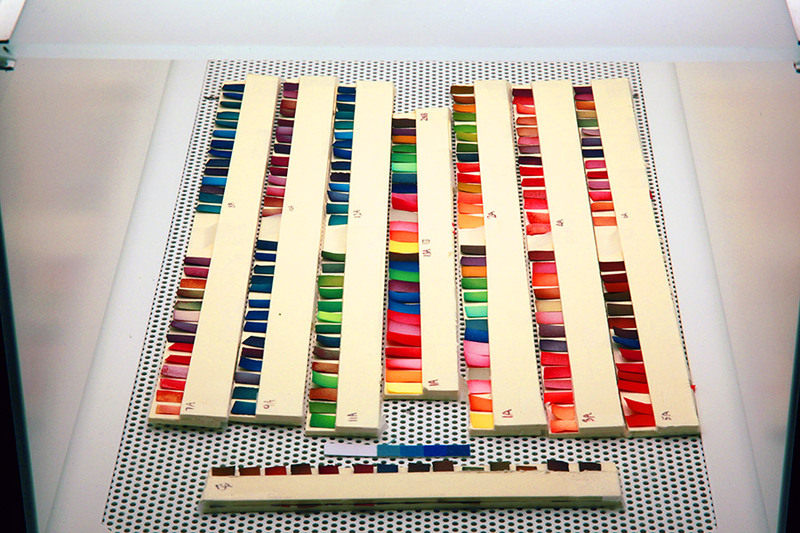 Research is presently shedding light on the fading behavior of pigments and dyes at differing light levels ranging from low museum conditions to the intensities applied using microfadeometry. Results enable the comparison and accuracy of accelerated ageing techniques as well as highlight reciprocity failure within the individual sample. This will be investigated in depth over a three-year period (2011–2014), particularly with the idea of comparing traditional museum lighting to the emerging solid-state lighting. In 2011 a two-year postdoctoral fellow joined the project team. The fellow will play an integral role as the GCI pursues an investigation of a central principle in accelerated aging experiments; the reciprocity principle or the Bunsen-Roscoe law. This law implies that the total amount of photochemical damage is not solely dependent on the rate of irradiance but directly related to total exposure. This is the principle question in determining how accurately the future of museum objects can be predicted with techniques presently applied at the GCI and worldwide. In addition work on the use of microfading instrumentation within museums will continue. As the use of the technique has grown and the data obtained becomes increasingly at play in guiding museum policy, it has become necessary to increase access to and broaden the application and potential of the technique both with new apparatus as well as experiments to guide interpretation of results. In the museum field photochemical damage is often assessed by measuring the surface color change resulting from light exposure. The reciprocity principle has been investigated by De Hoyo-Melendez and Meckleburg (2011a) comparing the color changes induced by accelerated ageing at different intensity rates. However this approach presumes that it is correct to extent the application of Bunsen-Roscoe law from its original chemical frame of formulation to the connected arena of % reflectance (i.e, a physical property linked to its perception by the human visual system). The relations between the photochemical change, the subsequent change in reflectance and the translation of the later in terms of visual perception have been recently investigated. More specifically the relation between the change in the Kubelka-Munk absorption and the total exposure will be further investigated. This work should help to set a stronger theoretical framework upon which investigations of the reciprocity principle and light sensitivity assessments could be carried out with their analyses rendered more reliable.